The Town Council have completed the lease to take over responsibility for Highfields Play Area from Stroud District Council for the next 25 years (until 2041). We have started the process of looking at the work required to bring the area up to an acceptable standard. We will be concentrating first on those issues we consider to be a priority e.g. work related to safety. The work is expected to last approximately one week and the working areas will be fenced off from the general public. The contractor will be accessing the play area from the School Road/Second Avenue junction. Please park considerably near this location to prevent any difficulties with access. Thank you to all our volunteers who supported our Community Day at Highfield's Play Area on the 29th May 2017 despite the Bank Holiday rain. 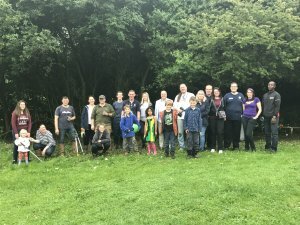 The volunteers enjoyed a BBQ supplied by Cam Family Butcher and were kept refreshed with tea/coffee and soft drinks from the Hummingbird Café. 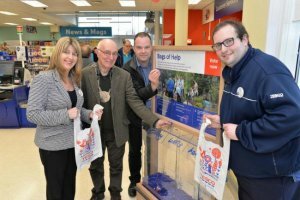 We were selected for grant funding by TESCO and the after the community vote in local stores we were awarded a grant of £1,000 towards our Community Day in Highfields Play Area. The Community Day was held on Monday 29th May 2017. The Green Spaces Committee have confirmed two areas for improvement early in 2017. 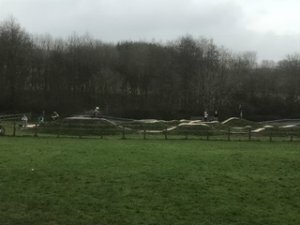 The first major improvement at Highfields has now been completed with the refurbished BMX track being recently completed and reopened for use. The improvement works included re-grading the areas of "dirt" track and surfacing the corners and bends of the track, which will result in a longer wearing track which will reduce the level of future maintenance required by the Town Council. These improvements will significantly improve the quality of the ride for our BMX enthusiasts. The finished BMX track at Highfields Play Area.